Nicholas Hellmuth reviews the Trotec Speedy 300 CO2 laser engraver with other brands of CO2 laser engravers and cutters. 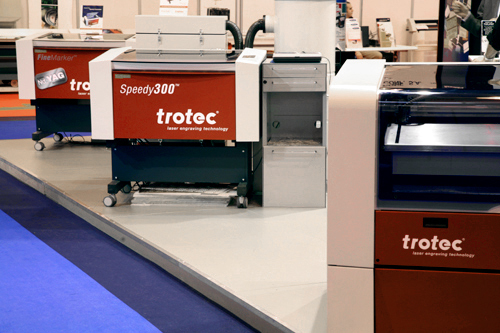 Trotec Speedy 300 CO2 laser engraver system. 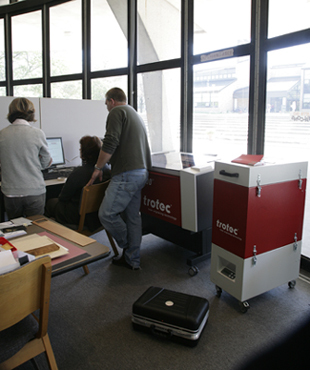 In 2006 FLAAR received a Trotec Speedy 300 CO2 laser engraver system for review in the FLAAR digital imaging evaluation facility on the campus of BGSU. The staff of CAT (Center for Applied Technology) completed the review after several months of testing. A Universal M-300 is also in the same testing lab. So over these months we could be evaluating and comparing several brands of CO2 laser engraver and laser cutters. We see lots of cheap Chinese, and Korean laser engravers at trade shows in Turkey and Europe. 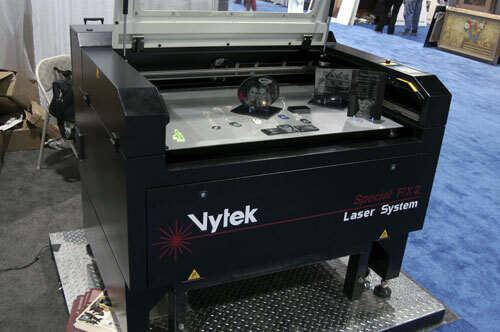 These cheap laser engravers are also appearing at US trade shows such as Graphics of the Americas. But we prefer to work with laser engravers made in the US, Europe, Taiwan or Japan, or at least handled (distributed) by well-established companies. GCC would be an example of a brand that has a well established engineering company behind it (in Taiwan) and a network of tech support both in the US and Europe. I am familiar with the capability of GCC as a company since I have spent several days inspecting their factory in Taipai. The Trotec Speedy 300 laser engraver system was capably installed by Scott Hutchison and Amie McGee. They also provided training to the staff at BGSU. 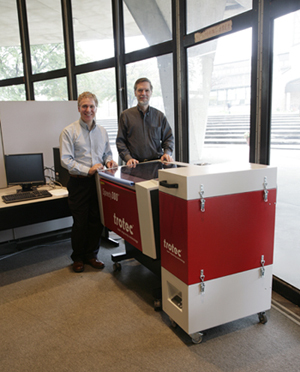 Trotec laser engraver in the FLAAR facilities on the campus of BGSU. Prof. Chuck Spontelli and Prof Nicholas Hellmuth admire the new arrival. Unfortunately, no fault of theirs, the system which was sent by Trotec was an old demo model. It had probably been shipped back and forth across the USA ceaselessly to trade shows and customers. By the time it arrived at our test facilities it was, quite frankly, rather worn out. Certain key portions were out of alignment. But one part that did work well was the exhaust; if you have any brand or model of CO2 laser engraver without an exhaust then you will have vile odors or melted plastic and incinerated acrylic floating around your room that can make your staff sick and definitely will make your staff wish to get out of their offices and stay away. The Trotec exhaust worked well. But overall I was disappointed. 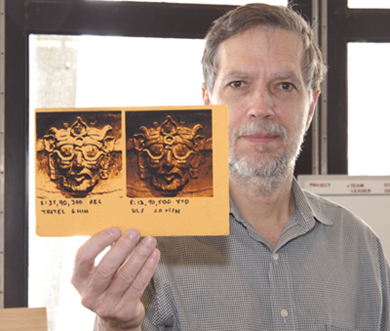 The system required a design software that most artists and graphic designers on our university campus seldom used. And my impression was that only a few materials could be handled well. But possibly the misalignment and aging components of being a used (and probably previously abused) system doomed this particular model. Maybe if Trotec had sent a brand new model it would have functioned better. Considering that this machine is made in Austria I expected much better performance. I lived in Austria for eight years, indeed by PhD is from Karl-Franzens Universitaet in Graz, Austria, so I can vouch for the general kind of product that you expect for Austria. But in many respects our more economical model of Universal CO2 laser engraver / cutter worked better than this expensive Trotec. So if you compare prices the only advantage of the Trotec was the ventilation/exhaust system. But you can obtain other brands of CO2 laser engravers and cutters also with a ventilation and exhaust system. 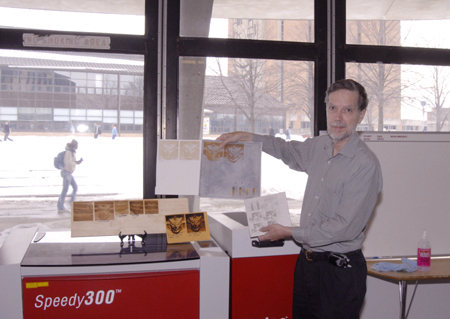 Now, in 2009, FLAAR is considering retesting CO2 laser engravers and cutters, both for signage, for cutting materials to create architectural models, and for traditional awards engraving. I see the Universal brand of laser engraver at most of the trade shows that I visit around the world, so this may be the brand that we evaluate next. Three different models of Trotec laser engraver/laser cutters at Sign Spain show, Madrid 2006. The Vytek F/X Laser system is ideal to reproduce precise copies of any project.